Some of the boys were very keen sportsmen as they took part in carpet bowling tournaments, cricket and sports days as is seen in the extracts from the local newspapers. In the family trees there are connections to other parish families, the McCraes and the Bells. The family belonged to the United Free Church opened in the village in 1893 and there is a photograph of the opening ceremony in which several members of the family are identified as well as ones of other family members. There is a family grave in the Kirkyard. The inscription and site of the grave can be found from looking the catalogue and plan of gravestones in Carsphairn Kirkyard which is available here. 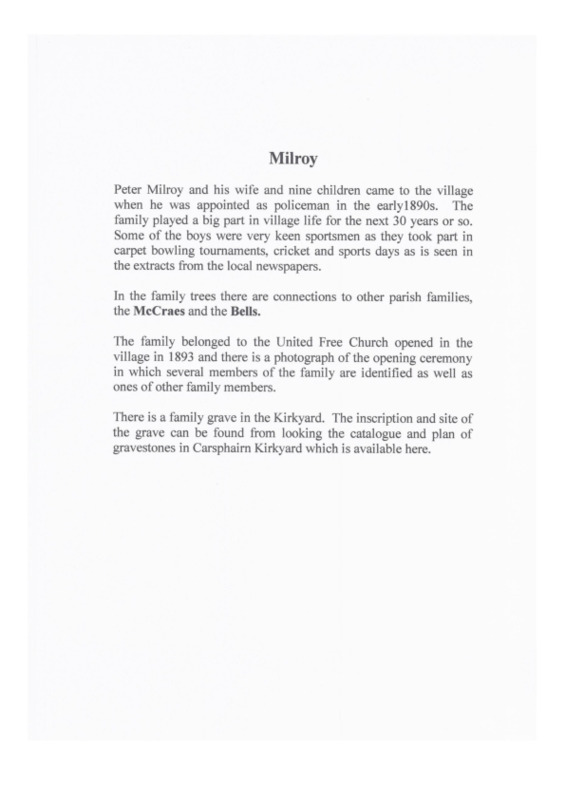 IS, “Milroy Family History,” Carsphairn Archive, accessed April 21, 2019, http://carsphairn.org/CarsphairnArchive/items/show/84.